After two months in monster city like Cairo, Aswan is a breath of fresh air–literally as well as figuratively. This morning, waking up to my hut dappled in sunlight then practicing on the terrace of the main building in Fekra Cultural Center, to my left was the rising sun and to my right was the blue Nile River (I couldn’t decide which I wanted to salute towards more, so it was a draw! ), I remembered how important it is too be in the elements, to be in nature. I felt how my practice in this setting is very different. I took my time. My breaths were long. I wasn’t in any hurry. I also felt my body differently. I noticed the build up of urban/work tension in a way I hadn’t previously. Nature allows us to tune into the nature within, it reflects back at us how close or how far we are from that nature. It is a keen mirror, allowing us to reflect deeply on ourselves. Feeling blessed to be able to share this very special place with 17 retreat participants. We start today’s program at 4pm with an opening circle. The second Ashtanga in Aswan Retreat will be on 24-27 December. There are still places. Message me kaz.castillo@gmail.com to join. 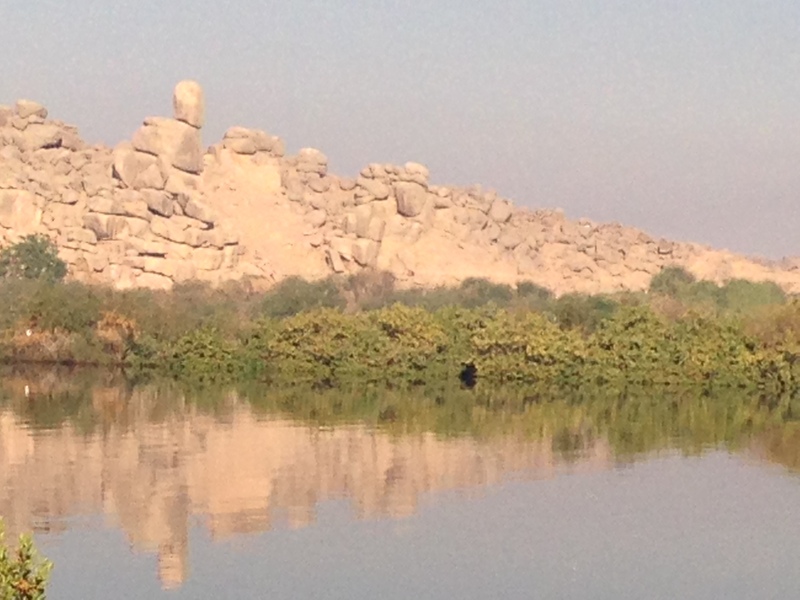 Photo: Island reflection on the Nile. This is the view of a place often referred to as the back of a dragon across Fekra’s grounds. This entry was posted in Classes & Offerings, Musings from the Mat, Musings off the Mat and tagged Ashtanga, Aswan, Egypt, Nile River, Retreat by sisterhoodofthetravelingmala. Bookmark the permalink.